TRANSRIPTEASE (2007) is New York City’s First Solar Powered Oyster Reef, a living art work, growing in the intertidal zone in MCNEIL PARK on College Point, Queens NY. For the past few years artist Mara G. Haseltine has immersed herself in what she has described as “The Great New York Oyster Movement.” This cross-disciplinary project involves marine biologists, environmental scientists, community activists, oyster farmers and gardeners work to find the best solutions for restoring oyster beds which have historically graced New York’s Waterways in abundance. The idea is to bring back Crassotrea Virginica to New York, which would create a natural filtration system that cleans the waters and simultaneously brings back biodiversity that has been missing in New York’s waters and estuaries since the Industrial Revolution. Oysters are the backbone of the benthic habitat and can act as natural water Treatment plants. 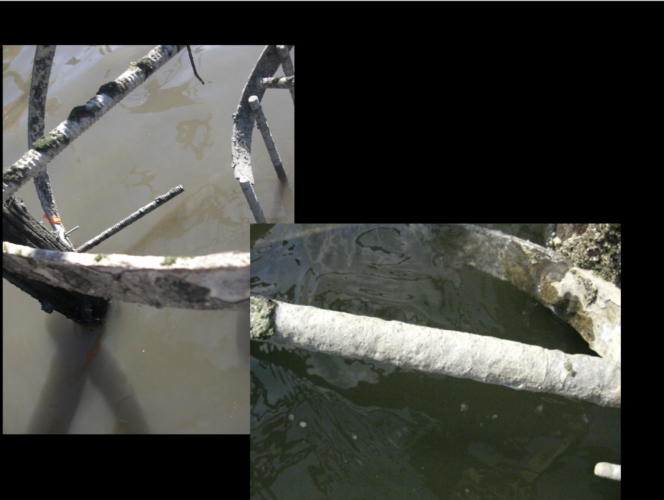 The average oyster filters 5-25 gallons of “nutrient” rich water per day. The restoration of 100 square miles of reef would filter twenty seven billion tons of wastewater that flows into New York’s Waterways annually. The reef would not only be a haven for oysters but would quickly become a diverse habitat for aquatic life of all forms from gastropods to Striped Bass. In June of 2007, Mara G. Haseltine created and installed her first oyster reef, a pilot project experiment in New York City, in McNeil Park on College Point, Queens NY. 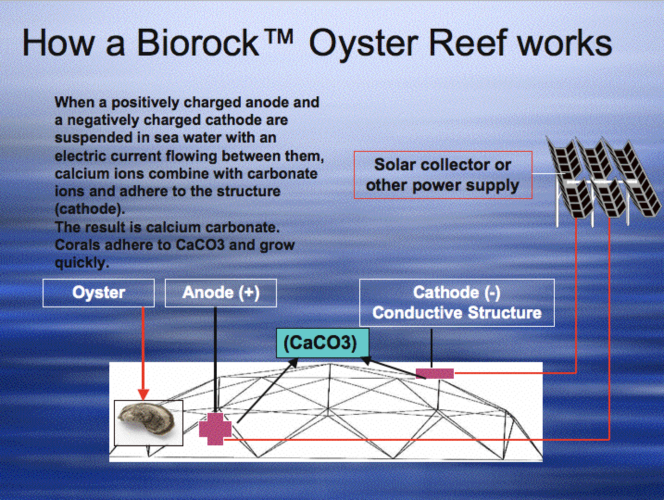 The project is the first of its kind in New York City using low volts of electricity from solar panels to produce the accretion of calcium carbonate conducive to oyster growth. The “Biorock” process was originally developed by Architect Wolf Hilbritz and is used worldwide for coral reef restoration – see Global Coral Reef Alliance. Haseltine collaborated on this project with marine biologists, Colombia University Graduate student Katlin Baird and engineering student Michael DiDonato. For this reef Haseltine’s concept was to create a modular design in metal, using solar panels to send low volts of electricity to metal and thus causing mineral accretion to occur as calcium carbonate formed on the structures. In the wild, oyster larvae typically settle on oyster shells which are composed of to calcium carbonate or limestone. With this experiment the calcium carbonate covered surfaces of the metal will in time become ideal settling spots for oyster larvae. In keeping with her previous work Haseltine has peered into the microscopic realm to find the perfect shape for her structures and create a design inspired by the double helix in the act of transcription of RNA. 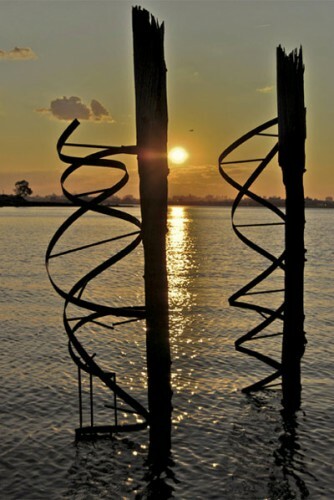 Haseltine playfully dubbed the sculpture TRANSCRIPTEASE as double-helix shapes unwind and seem to dance around the pilings bringing both aesthetic beauty and optimal functionality to the project. TRANSCRIPTEASE also doubles as a teaching tool – the sculptures depict DNA in the act of replication, one sculpture is a fully formed DNA helix, and the other depicts DNA in the act of unraveling into the two separate strands of messenger RNA (mRNA). The vertical twisted forms are optimal for oyster beds because its vertical shape allows for water to flow freely thus allowing oysters to receive the maximum amount of nutrients and keeps them above the sediment at the bottom. Vertical structures with plenty of ventilation space where nutrients can reach the oysters have proven to be the best way to grow healthy oysters. This design is actually an improvement on the typical oyster midden in which the oysters at the bottom are often smothered in sediment or covered by other oysters at the top of the pile so the ones on the bottom literally starve. 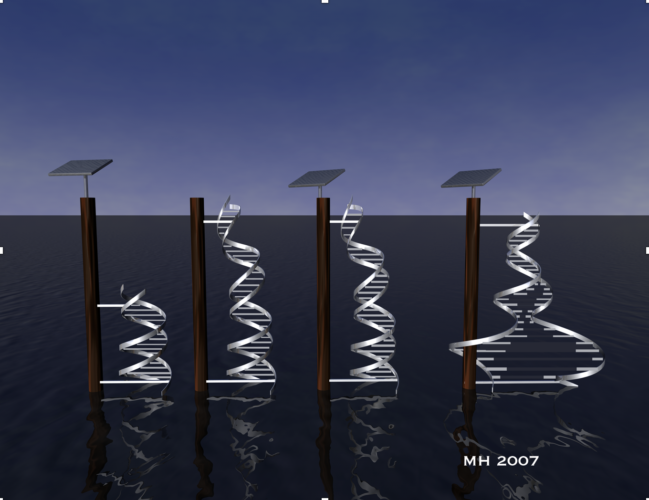 To offset this problem, Haseltine created a design inspired by the double helix which allows for water to flow freely in order for the oysters to receive the maximum amount of nutrients. Haseltine utilized the architecture of pre-existing wooden pilings as a structural support to create vertical structures. This is an environmentally sound and elegant use of the pilings, which cannot be removed as they are considered hazardous waste and are found throughout the coastline of New York’s waterways. The use of the pilings has the advantage of more strength as well as saving space and fostering water purification while still enjoying the advantages of re-creating a biodiverse habitat, which does not interfere with Benthic or bottom dwelling fish. Materials: metal, solar-powered panels, oysters.